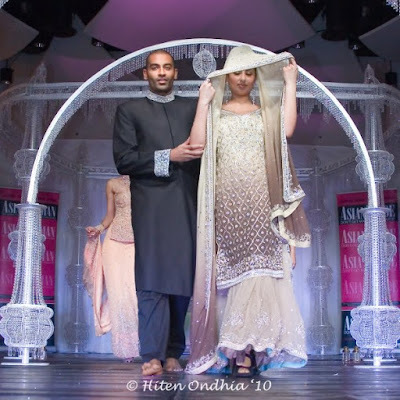 Javeria and Roshi's brought a different feel to the catwalk at the 2010 Manchester Asian Lifestyle Wedding & Fashion Exhibition. We'd already seen short tops paired with lehngas, a few toned model stomachs (and even some visible underwear!) 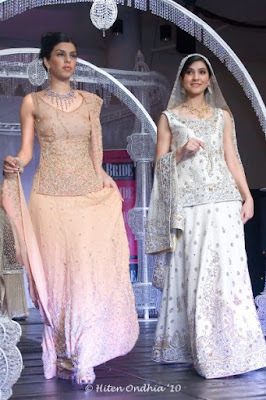 from the likes of Shagun and Alankar, but Javeria and Roshi's collection was all about long flowing tops! 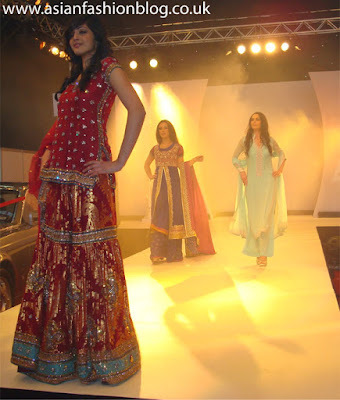 My stand-out piece from the collection was this red gharara. As you can see from my pics the lighting and smoke effects didn't really work with my camera, but one of the press photographers at the even captured a slight colour variation on this outfit from one of the other catwalk shows which I've included below. 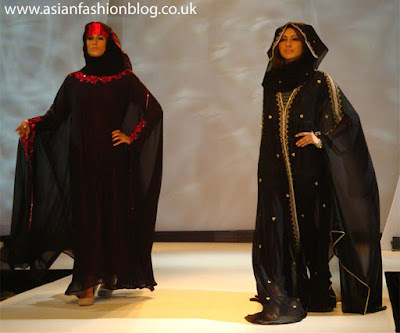 Now this is a first for asian fashion blog, and I think it's a first for The Asian Wedding Lifestyle and Fashion Exhibition too - a hijab collection on the catwalk! 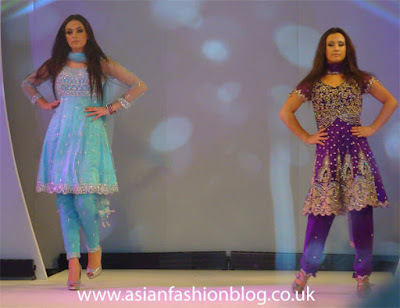 It was the Hijab Centre in Blackburn who stepped up and decided to showcase their collection at this event. They didn't have any full bridal outfits, but their collection of embroidered abayas and cover-ups held their own against the other exhibitors on the day. They used floaty fabrics and shapes to create a feminine but modest look, my only complaint was that nearly everything was black! This last outfit was my favourite, I liked the mixture of orange and black and I think the styling of it all works really well! 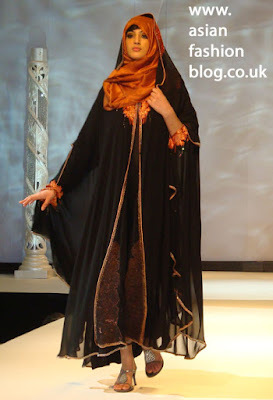 I only viewed the first catwalk show, but The Hijab Centre have uploaded some video's of the show to their youtube page showing some different outfits which they showcased at the other catwalk shows over the weekend. 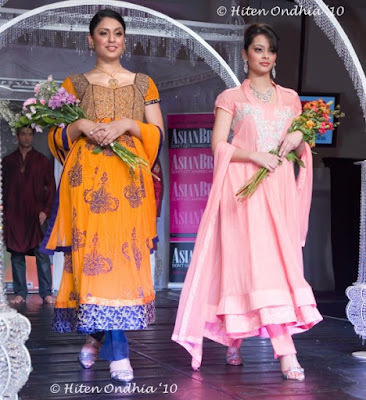 Shagun, another shop based on Wilmslow Road in Manchester were up next on the catwalk at the Asian Wedding & Fashion Show. I can see myself wearing these last two shalwar suits, they're heavily embroidered enough for a party or wedding but don't have that "christmas tree" over the top feel to them. 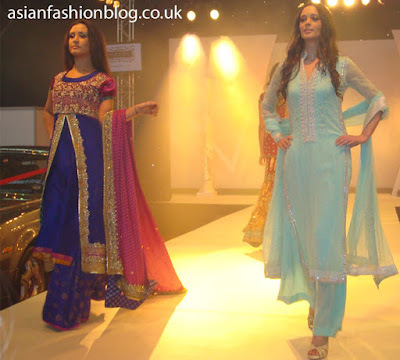 This weekend Manchester held host to The 2010 Asian Wedding Lifestyle and Fashion Exhibition. This 2-day event in my opinion is the biggest and best Manchester has to offer in terms of wedding exhibitions...and I use the term "best" very loosely!! Don't get me wrong, it wasn't terrible or anything, and had I been a bride-to-be I'd probably have found it very useful, but I wasn't there to pick out a wedding stage, I was there for the all-important fashion show! The clothes themselves were beautiful, but it was little annoyances like the over-use of their smoke machine (which made it very hard to take a decent photo) and being able to see the models' underwear (because the clothes weren't fitted correctly) which stopped this from being a great catwalk show in my opinion. Maybe I shouldn't be so harsh, because I watched the first catwalk show on the first day, and I guess there's always a few glitches in the first run. Anyone else who attended - what did you think of the event? 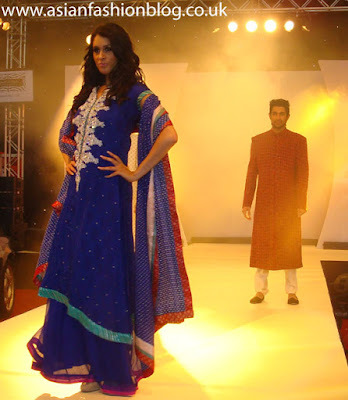 It was good to see some gharara's on the catwalk, and not just from this exhibitor. Alankar's went for a full-on showcase of heavy bridal outfits but there was a lot of variety and I loved some of the colour combinations, like purple, red and green as seen in the photo above and below. What do you think of this last outfit with the velvet top and sheer panels on the stomach? I liked the colour but not such a big fan of the velvet/sheer top combination. We already had a behind the scenes look at the Eastenders Asian Wedding, (click here to check it out if you missed it) but it wasn't just the bride that everybody was talking about! 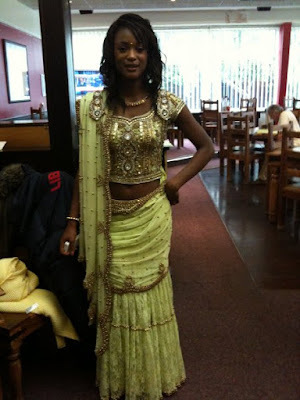 Another outfit which caught the eye of many viewers was the mehndi outfit the character "Chelsea" wore, played by actress Tiana Benjamin. 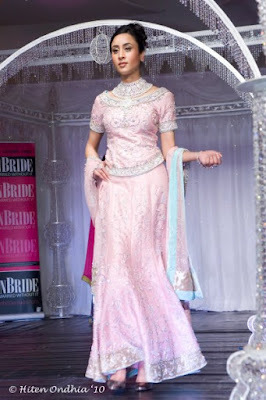 Jasmin, from Jusst Pink, who designed this outfit got in touch with me to tell me a bit more about dressing a character for a big tv asian wedding. It all started with a visit from the Eastenders costume design team. They explained their ideas and Jasmin drew some sketches, talked through fabric and colour choices and the final design was chosen: an asian outfit with a Victorian twist! 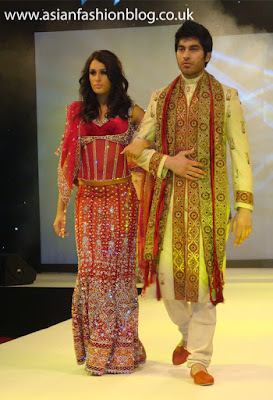 Similar outfits were also created in pink for other characters/extras who took part in the mehndi episode. 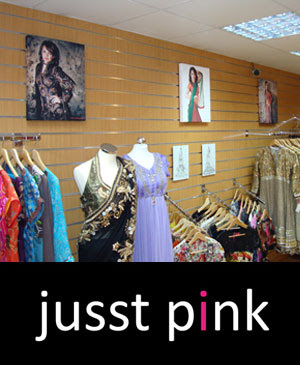 So now you know - if you fancy an outfit straight off the tv, Jusst Pink are based on Green Street in East London. 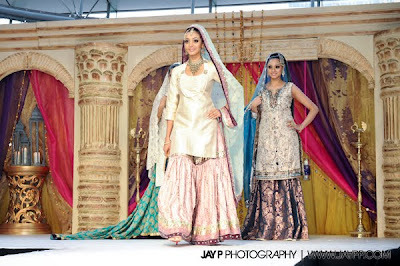 I've finally managed to get some snaps from the London Asiana Bridal Show 2010, courtesy of Jay P Photography. 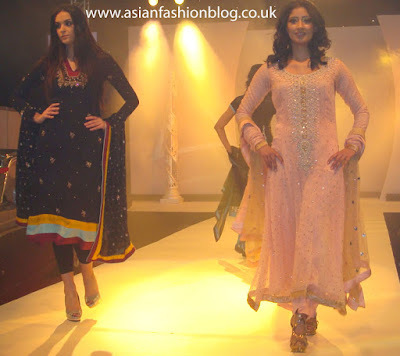 Here's a selection of outfits by Kiran Khan and the very popular Mongas in London. This is the first time I've seen black on a bridal show catwalk since the Sana Designerwear outfit at the 2008 Asiana Wedding show. 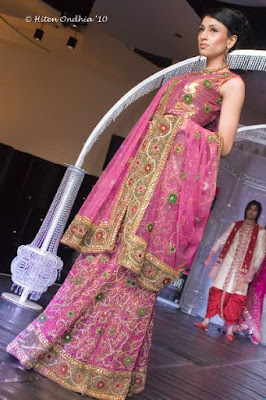 Back then, I was sceptical that a bride would ever wear black, but I really like this Kiran Khan outfit! The pink top keeps it bright and even though it's not a conventional colour combination, the styling of the outfit has a very traditional feel to it. I don't think everybody could carry off this type of outfit but I'm sure there are plenty of brides out there looking for a real stand-out dress and this is it for me! I really loved these last outfits too, because the embroidery seems quite minimal, and it's the rich fabric choices which make them sparkle. 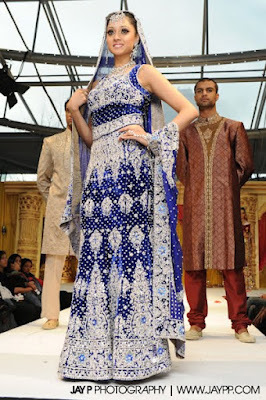 Now these were full on embroidered all-over bridal outfits from Mongas. I especially liked the red outfit in the centre of this last photo because of the red and white design at the top of the skirt - it's little details like that which set these outfits apart from your usual same-embroidery-all-over type of wedding lehngas. 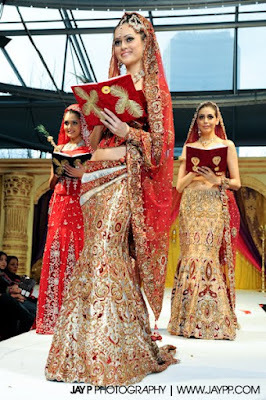 Imani Studio were another one of the exhibitors at the 2010 Asian Bride Show, held at Wembley Stadium. 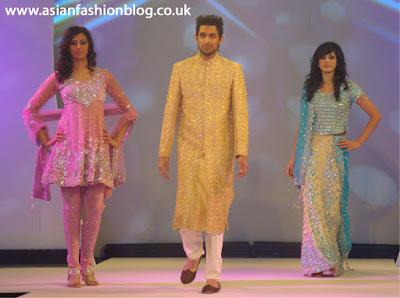 I reviewed their Manchester store waaay back in 2008 (click here to check it out) and was impressed with their collection of Pakistani designerwear. They're still going strong and have added to their appeal by getting designers such as Maria B and HSY to make in-store appearances and individual customer consultations. 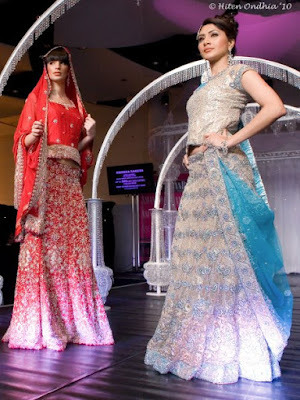 I'd say they're a must-visit for any UK bride looking for a designer outfit without having to go to Pakistan to get it! Having said all that, although the collection they had on show was pretty, for me there wasn't one standout "wow" outfit. What do you think? Many thanks to Hiten Ondhia from Cupid Studio for the photos. 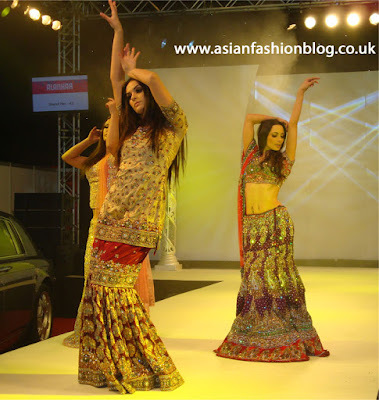 My recent posts have largely been about the Asiana Magazine's wedding exhibitions, but rivals Asian Woman Magazine and Asian Bride have also been busy organising their own wedding shows in London and Birmingham (but not Manchester! I'm still annoyed that their Manchester Wedding Exhibition was cancelled last year without much of an explanation). Their London exhibition, held at Wembley Stadium, went ahead as planned this year and although I didn't attend I've found some photos from the catwalk show courtesy of photographer Hiten Ondhia from Cupid Studio. I don't really see anything spectacular about their bridal lehngas, sure they're pretty but there's nothing unique or special looking about them. 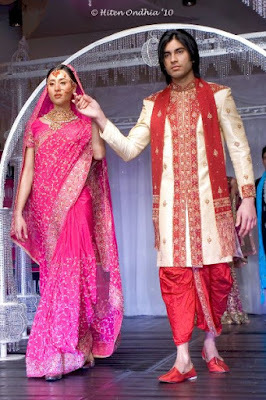 As for the two partywear/wedding guest pajama suits in pink and red, I'm really not liking the tops! In my opinion they highlight the chest in a bad way! I didn't really like these two pink bridal outfits either. 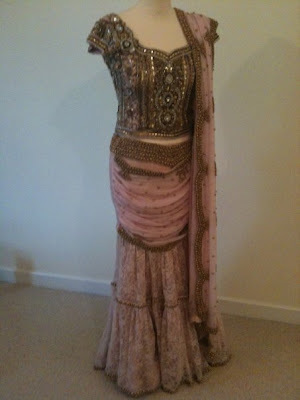 The pink, gold and green colour scheme on the first outfit just isn't to my taste, and I think the sari looks a bit bland/boring - one colour sari fabric, one colour embroidery and the same pattern nearly all over! These two outfits were slightly more interesting than all the rest, if I had to pick favourites it'd be these two. If you want to see a video of this part of the show, here's a link. I'll be posting more photos from the catwalk soon, but for some insights into what the rest of the exhibition was like (and the afterparty) check out Khiraki's blog. 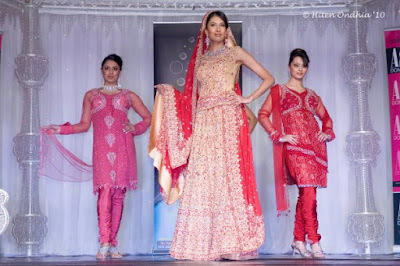 Yesterday, the Riverbank Park Plaza played host to the London Asiana Bridal Show 2010, unfortunately I wasn't there but from all accounts it was bigger and better than the Birmingham show a few weeks ago!